I am going to keep it short and sweet today because, one we are headed to the lake for one last summer excursion and two you need not to read my rambles, but instead go enter to win one of three necklaces from Sassy Steals. If you haven't heard of Sassy Steals, bless your heart and bank account. Are you ready for a daily deals site that will change your life? Sassy Steals brings to you daily boutique and homemade deals coupled with weekly giveaways. Think statement jewelry, trendy clothes and home decor at discounted prices that will blow your mind. All you have to do is register your email and all the glorious daily goodness will be sent straight to your inbox. Just take a peek at a few of the steals going on right now. Rainbow Statement Necklace for $10! You guys have to hurry because these deals end TODAY and could possibly be gone forever! Now this is the part where you come in! 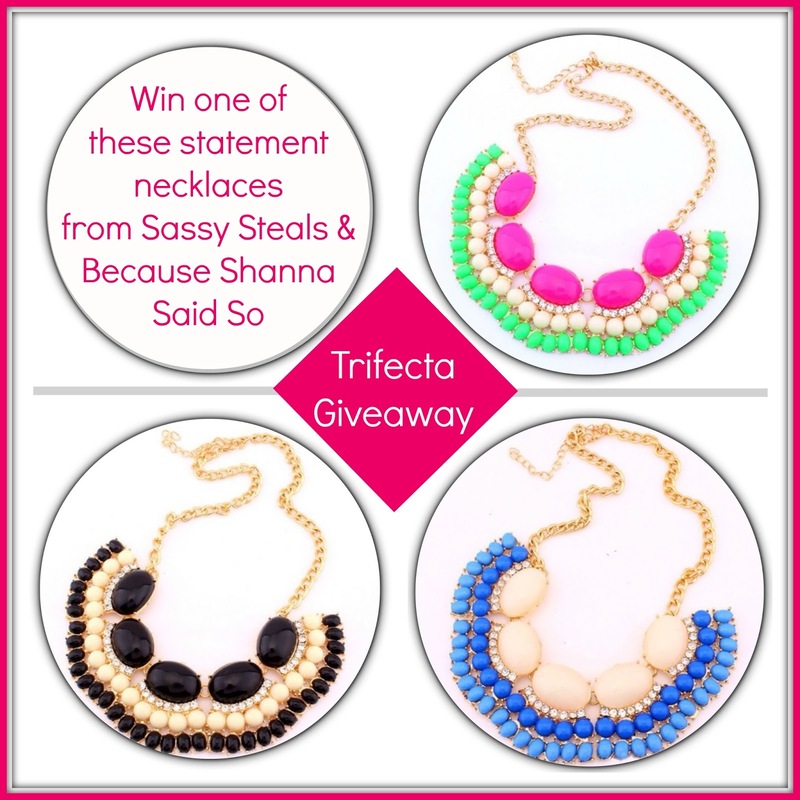 Sassy Steals has so graciously offered not one, but THREE statement necklaces that will be sent to three lucky ladies. 3. INSTAGRAM ENTRY: Repost photo below on Instagram, follow Because Shanna Said Said So and Sassy Steals, hashtag #TrifectaGiveaway and comment that you posted so that we both know! You are more than welcome to do all three or pick/choose how you want to enter. I'm pretty positive that all of you want your chance to win one of these three amazing J.Crew inspired statement necklaces. Note: Winners will be randomly sent one of the necklaces shown below and will not be able to choose color preference. All necklaces are the same style & quality. Who's ready to win and of course start receiving the most amazing daily deals on the face of the planet? And.....GOOOOOOOOOOOOOO! Happy weekend and happy shopping. this is so chic on you! I am loving that blazer! Have fun at the lake!! Love the colors and the giveaway! Those loafers are the best!!! You look so cute! This is such a great casual look but so chic. I love the leopard loafers. I might not have gotten the leopard clutch but I did order some heels. Hope they fit! I did all 3 entries! WOohoo!! I love how you kept your whole outfit to just the colors in the necklace. White and blue look great together. And the leopard flats are the perfect touch. Love the outfit! Those loafers make it in my opinion! Love this outfit, the flats are so cute. I really love this blazer on you! Thanks for sharing - just got one of those colorful pastel necklaces! Love that blazer! And I've already made too many purchases through sassy steals! I almost bought those midi rings they just put up but I hate the idea of doubling the cost for shipping, even if the price still is good.I'm just stubborn I guess. I really adore that jacket, what a vibrant and lovely blue. The necklaces are just gorgeous! My statement necklace collection is getting out of control but of course I entered the giveaway :) Have a wonderful weekend! Okay, so I LOVED this photo before I SAW it with those shoes, NOW I LOVE IT EVEN MORE! You have the best sense of style girl! ahh these colors are gorgeous. i need those midi rings in my life!! I'm so obsessed with this outfit! You look amazing as usual! And I want those midi rings! Love those loafers and that thrifted lace! I think it's a crime I don't own any leopard loafers...those need to go on my fall wish list. What a pretty blue blazer, and so perfect with that necklace! Checking out the website... the price points are impressive! Wow! The prices for their jewelry is amazing! I'm used to pieces like that going for $30.00! can you look any more amazing?! I love the surprise of the leopard shoes!! You look amazing in this outfit! I love the blazer with the lace top...and the leopard loafers are a nice touch! I love this outfit, gonna pin it for inspiration. the blazer, the lace, the necklace and the leopard flats soo my style! enjoy your weekend! :) i love your hair like that! Love the white with a pop of blue and leopard! Keeping it fun and classy!